Corte Citadel is one of the most impressive at first glance places in Corsica. Cooled on top of a high hill in the heart of Corsica, Corte Citadel dominates the small tile town, situated among the beautiful mountains and valleys of the local scenery. 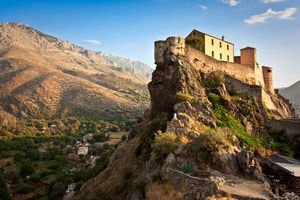 Corte Citadel is the biggest attraction of this picturesque town located in Corsican. Today this castle of the rock history museum is housed in Corsica. Corte Citadel is visible from anywhere in the town, situated on the hill. For the convenience of its visitors they have built a special observation platform from which all its beauty is found which includes not only the view of the Corte Citadel, but also the surrounding mountains, among which the Corte sits. The powerful design of the Corte Citadel is home to three observation towers, which are oriented to three directions of the rivers flowing through the region - Tavignano, Restonica and river Orta. As the only military fortification in the inner lands of Corsica, Corte was built on a strategically important and decisive place that provides control of all internal areas of the island. The castle is central to all shaking events through the ages here. In the 18th century, after a shattering war, Corsica became the first country in the world to adopt a democratic constitution. In 1729 there three uprisings and despite the intervention of Austria in 1735 Corsica declared its independence. Today Citadel of Corte is a wonderful place for cultural events. Climbing the steps that follow the wall of the citadel you can reach its top point which is boasting of the most breathtaking views of the town and throughout the beautiful countryside. It is believed that the Citadel of Corte was built in 1419 by the Viceroy of Corsica Vincentello d'Istria, on the initiative of the King of Aragon. The Museum of Anthropology, which is beyond the stone walls on the court was opened in 1997.The exhibitions offer visitors a wonderful journey through the history, traditions and culture of Corsica, illustrated with a variety of interesting exhibits. The second floor of the museum is home to an exhibition dedicated to the industrial development of Corsica in the late 19th century. The museum is complemented by an exhibition hall for temporary exhibitions, an art library and educational visitor center.